Monkey Flower (sometimes written as either Monkey-flower or Monkeyflower) is a perannial plant that grows to a height of 0.6m. The stalkless ovate leaves are green and hairless and borne in opposite pairs along the stems. Tiny red spots within the mouth of the flower help distinguish it from the smaller Musk Monkey-flower Mimulus moschatus and more boldly red-spotted import from Chile known as Blood-drop Emlets. Flowers are 3 to 4cm long, open-mouthed with two lips, the upper of which is bi-lobed while the lower lip is tri-lobed, and borne in a lax cyme (a flat-topped inflorescence whose central flowers open first, followed some time later by the peripheral flowers). A distant relative of the Foxglove and a former member of the family Scrophulariaceae, from which it was recently evicted, this short, creeping perrennial is often found growing beside ponds and streams, often trailing right into the surface. Some plants grow with their roots actually in shallow water. 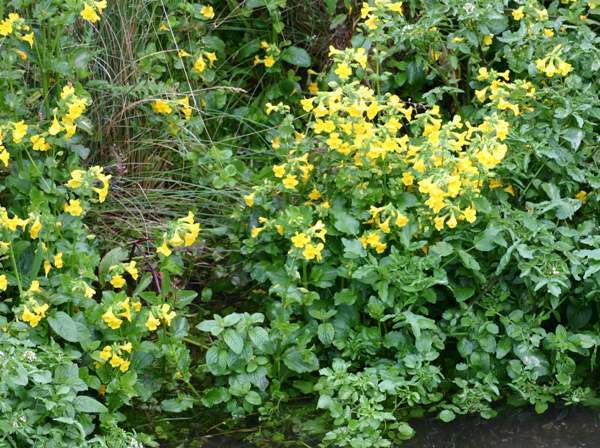 This plant is common in parts of England and Scotland but is scarce in Ireland. It was originally brought to the UK from islands off the coast of Alaska and has since spread widely from gardens into the countryside. 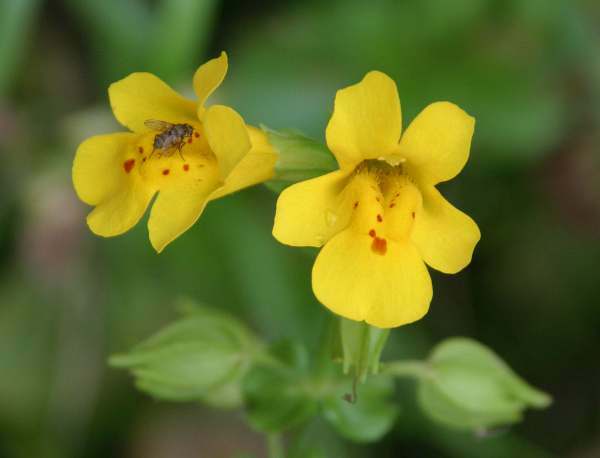 Monkey Flower is also found throughout northern and central Europe. 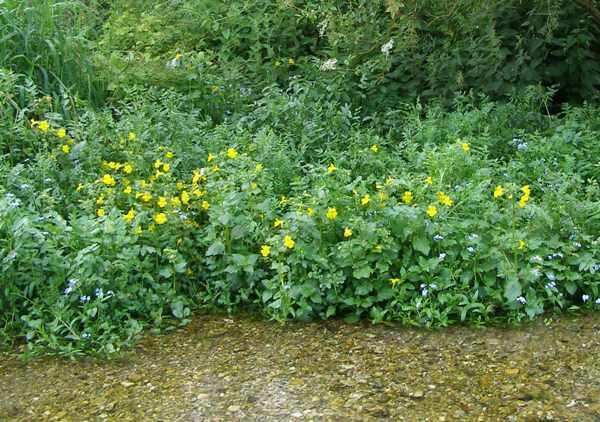 The plants seen on this page were growing beside a chalkstream in southern England.